Head out to the theatre, a sports match or even a village fete and chances are that lurking in the background will be a dedicated band of volunteers ready to leap into action if a member of public falls ill. For the most part they’ll be seen dancing along to show songs, cheering on their team or, when the British summer permits, basking in the sun and getting a tan. But when the occasion calls, the volunteers from St John Ambulance – who can range in age from teenagers to pensioners – make use of their first aid skills, and with their quick thinking could mean the difference between life and death until full medical help arrives. Like many British institutions, the charity was founded in the 19th century during a period of rapid industrialisation. Workplaces could be dangerous places, but when workers had accidents there was generally little in the way of medical help available for them. One group decided to do something to help and in 1877 set up St John Ambulance, providing classes across the country for training ordinary people in first aid so that accident victims could be treated quickly. Some ten years later William Church Brasier, a bookseller from Margate, gave training for people to deliver rapid treatment at public events. But the history of the charity goes much further back than the Victorian era; it originates from the foundation of a hospital to care for sick Christian pilgrims in 11th century Jerusalem. The organisation that administered the institution – it would become known as the Knights of the Order of St John of Jerusalem (and also known as the Knights Hospitallers) – wouldn’t however remain in the Middle East forever. And over the last year or so, I’ve found myself (somewhat unintentionally) following in the Knights’ footsteps as they moved their headquarters from the Holy Land to the Greek island of Rhodes and then Malta. The Order grew extremely powerful and at one time held over 17,000 estates across Europe and the Middle East. My journey began last year when I went to the Museum of the Order of St John in Clerkenwell, north London, for the first time. It was here that a Priory was set up in the 1140s as the English headquarters for the organisation. While the majority of the site has been sold off for building projects over the years, part of the original Priory Church of St John (a marvellous 12th century Crypt) survives. The actual museum is partly housed in St John’s Gate which dates from 1504, just a few decades before the institution was closed by Henry VIII during the Dissolution of the Monasteries, and was the southern entrance to what was once a vast religious complex. Jerusalem has seen many changes in power over the last thousand years, but I was still able to visit the Church of St John the Baptist, partly hidden from view by homes, in the Christian Quarter of the old city. It was here that by monks, under the guidance of Brother Gerard, had established a hospital, using the walls of an earlier church, to care for pilgrims who had travelled to the Holy Land on the Crusades. Knights wounded in the siege of Jerusalem in 1099 were cared for in this building and, in the years that followed, the hospital was given donations of land and money to support its work looking after pilgrims. But it cared for anyone, regardless of their faith or race and catered for different dietary requirements. The fact that the order assumed a military, defensive role in the Holy Land, once the city was re-taken by the Christians in 1099 explains why they became known as the Knights Hospitallers. Its headquarters was at what is now called the Church of St John the Baptist until 1187, when Jerusalem was lost by the Christians to the Muslims under the leadership of Saladin. The building itself was abandoned before being reclaimed, probably by Greek Orthodox priests, although it was said in the 16th century to have been used as a mosque. But apart from the modern facade with its two small bell towers, the overall fabric of the Church of St John the Baptist has remained mostly unchanged for almost one thousand years. When Jerusalem fell in 1187, the Order moved its headquarters to Acre in modern day Lebanon. That too was taken by the Muslim forces in 1291 and so the Knights retreated to lands in Cyprus for 18 years, running vast estates and sugar factories. 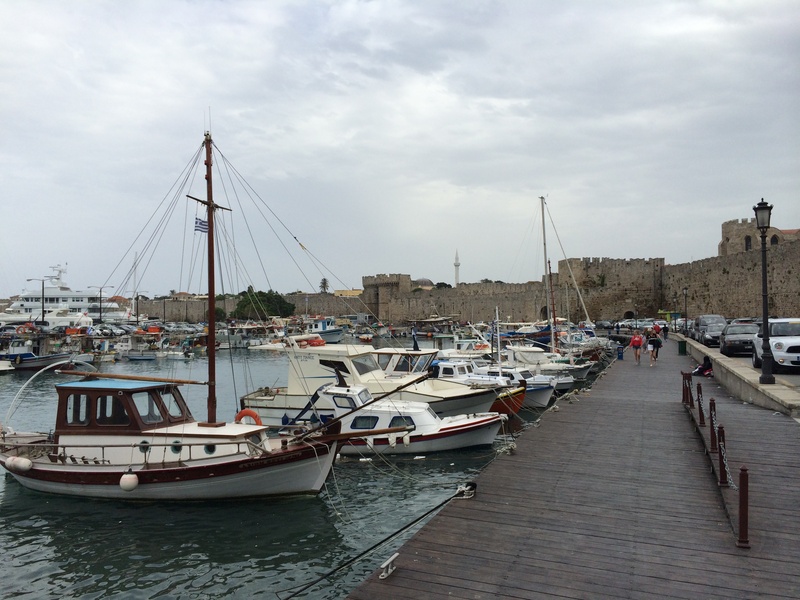 But they were to have a much more lasting impact on Rhodes, which they held from 1309 until 1522 when Suleiman the Magnificent conquered the island for the Turks. 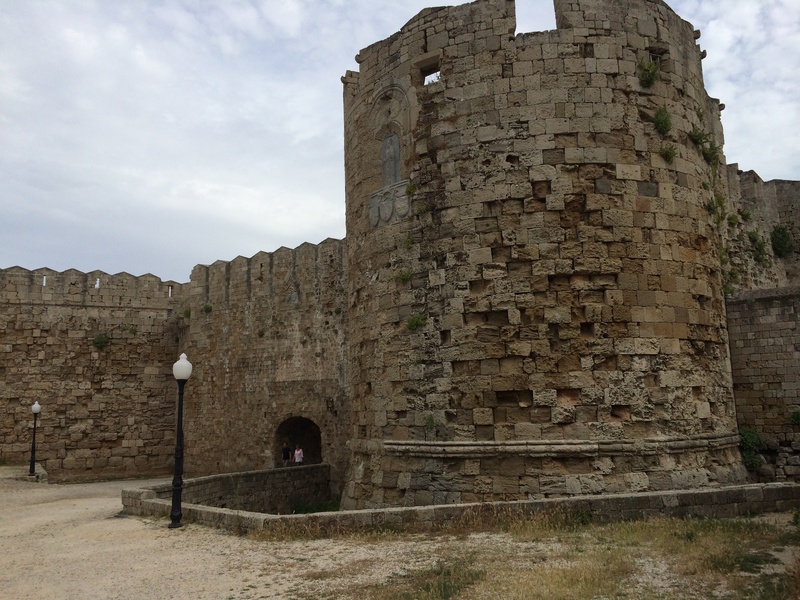 During the 200 years the Knights held Rhodes they built fortresses, auberges and a hospital, evolving from running a land-based army to the medieval period’s most powerful naval fighting force. The strategic position of island was important as it meant they remained close to the Holy Land, a launch pad that they hoped would day help them re-conquer Jerusalem for the Christians. 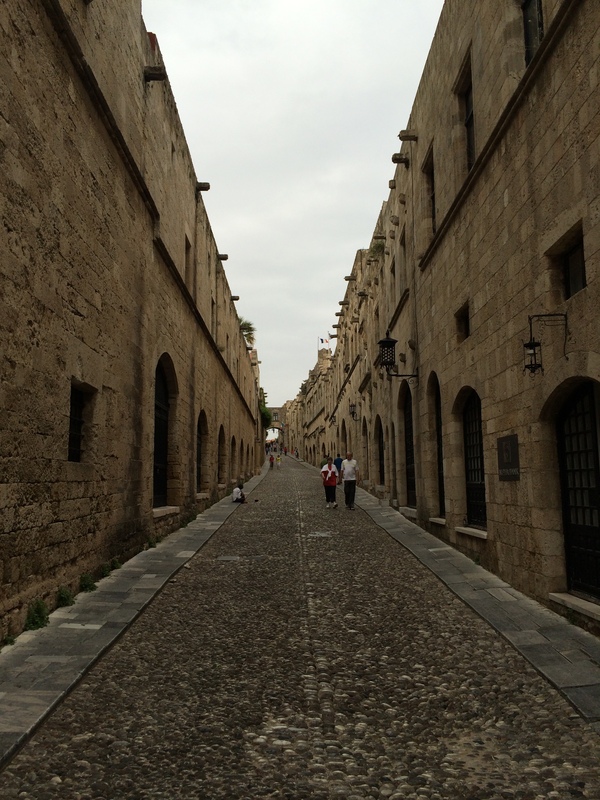 Traces of the Order’s contribution to the development of Rhodes can be best seen in the cobbled streets of the country’s capital, Rhodes Town. Medieval walls, built in the mid-14th century on a previous line, and re-constructed after an infamous siege by the Ottomans in 1480, provide shelter for a fine harbour enclose old city which is now filled with restaurants and shops (plus some very good museums and galleries) frequented by tourists. The 15th century Grand Master’s Palace, which was partly destroyed by an ammunition explosion but was later re-stored as a holiday residence for the King of Italy, stands at the top of the most important streets during the Order’s occupation of the island; the Street of the Knights. Here the Knights had their inns or lodgings, each representing the seven countries or tongues that they came from (most of the Knights were French, providing considerable influence on the architecture of Rhodes). Malta, which they held a little longer than Rhodes, from 1530 to 1798, became just as much their own fiefdom. Following an unsuccessful siege by Suleiman in 1565, the Knights built a new capital city, Valetta, named after their Grand Master, on an uninhabited island (a gilded bronze and silver portrait bust of Grand Master Jean de la Valette, c1565, is on display in the museum in Clerkenwell). The stakes had been high for the battle, with Queen Elizabeth I declaring: “If the Turks should prevail against the Isle of Malta, it is uncertain what follow to the rest of Christendom.” For Suleiman it remained an important target, with advisers telling him: “So long as Malta remains in the hands of the Knights, so long will every relief from Constantinople to Tripoli run the danger of being taken or destroyed – this cursed rock is like a barrier interposed between your possessions.” But he was of course never successful in this. The founder of Valetta decreed that it should be “a city built by gentlemen for gentlemen”. Many would agree that much of the elegance of this compact city, surrounded by water on three sides, remains today. Valetta is packed with history, to the extent that when Unesco named it a world Heritage Site it suggested that it is “one of the most concentrated historic areas of the world”. It was the first planned city in Europe, designed with straight streets to allow circulating sea breezes to keep the people cool. Impressive fortifications (chiefly to protect against the threat from the Turks) were completed in just five years and are still very much a feature of Valetta today. Aside from the Grand Master’s Palace (now the seat of Malta’s parliament and residence of Malta’s president), perhaps one of the most impressive buildings that can be visited from the era of the Knights is the Sacra Infermeria, a vast 16th century hospital constructed to cater for up to 300 patients at a time. Surgeons were reputed to have performed advanced operations alongside more routine amputations and the treatment of other wounds. 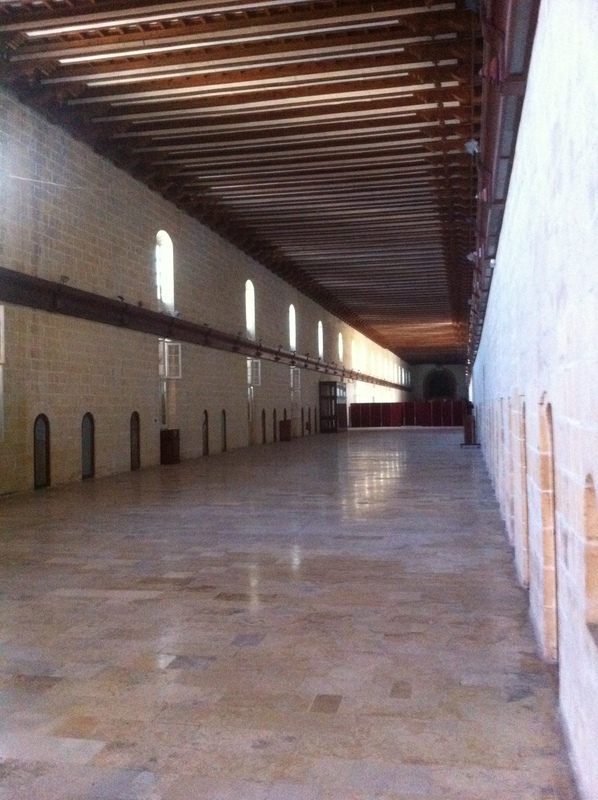 The main, long hall and surrounding rooms are still used today for a host of functions (when I visited staff were setting up for the Miss Malta final) and guided tours are offered. Napoleon was determined to take Malta and, shortly before succeeding in 1798, said: “We (the French) shall be masters of the Mediterranean.” When the island was lost, the Knights were homeless. Eventually the Pope provide some land for them in Rome, where the Order retains its headquarters to this day. But since 1798 the Knights have had no military role, focusing instead on charitable and humanitarian activities in more than 40 countries around the world. The Order, which today has about 20,000 members around the world, runs an eye hospital in Jerusalem that is open to all, and has outreach clinics in Gaza, Hebron and Anabta. And of course it is behind the highly successful St John Ambulance.